Thought Space Designs is a highly talented creative team with a variety of specialties all aimed at growing the size and exposure of businesses in all industries. From small local businesses still in the development phase, to national companies with seven figure annual revenue, we’ve had experience working with clients of all sizes. Our wide variety of industry experience has given us the skills necessary to adapt to any marketing challenge, no matter how large. We’re proud to say that over the years, we’ve grown from a small one man start up, to a talented team of individuals ready to take on any market. To put it frankly, bring it on! One of the best ways to learn about various businesses and industries is to immerse yourself within them. The Alloy 26 coworking space is a shared office space with over 50 businesses operating within. By working out of this space, we provide ourselves with an opportunity to learn all about local Pittsburgh businesses and network with some fantastic self starters. We’ve got access to private phone booths, conference rooms, lightning fast internet, great city views, and best of all, free coffee! 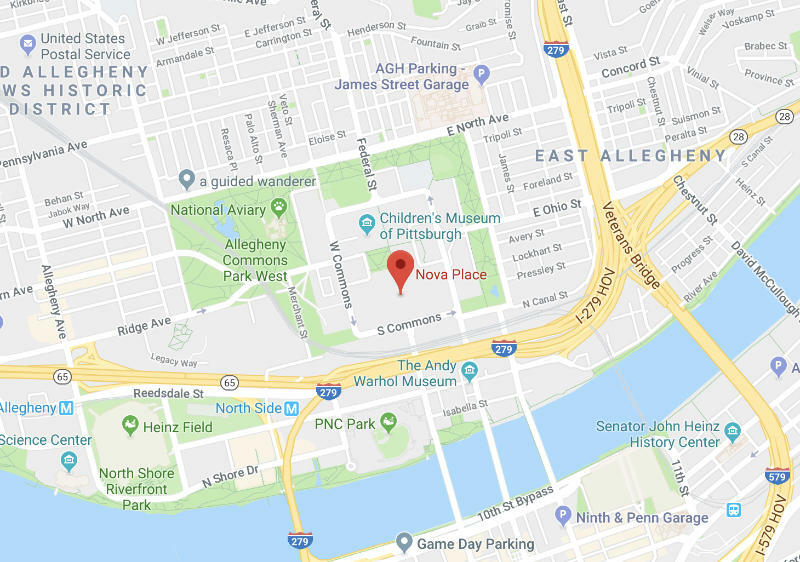 If you’re located around the Pittsburgh area and would like to discuss your project with us, drop us a line and we’d be glad to have you by our office for a free consultation! Thought Space started out as a one man show, and over time grew into a team of talented individuals with an eclectic collection of skills ready to tackle any need. Over the years, we’ve garnered loads of knowledge and insight by working with clients in a variety of industries and locations. We’ve traveled to various locations and served everyone from small businesses to large, established companies. Our experience enables us to adapt to any challenge, and gives us an out-of-the-box mindset when approaching any new project. Even if you aren’t located around the city, that’s fine with us! We’ve got years of experience working with a large number of clients remotely. We have a plethora of remote meeting and IT tools at our disposal that enable us to effectively work with clients anywhere in The United States. So, even if you aren’t available to come in and have a face-to-face meeting in our office, we’ll still be able to accommodate your needs and produce top notch work. Get in touch with us today to schedule a phone call or video conference to go over your project. We can’t wait to help you start your next big project! We Can’t Wait to Help You Grow Your Business! After years of working with a wide variety of businesses, it’s safe to say that the best part of our work is getting to create new relationships, and learn about new industries that we may not have ever heard about otherwise. For example, in case you weren’t aware, there’s actually a fairly large amount of professional dog poop scoopers out there that will gladly clean your yard for a monthly fee! The point is, we love learning about our clients and their businesses. Every new project we work on is a chance to grow and expand our own knowledge about the beautiful world we live in. Everybody is unique, and there’s no shortage of unique business ideas out there that prove this point time and time again. Nobody knows your business quite like yourself, and we’d love an opportunity to sit down and learn from the best! We foster relationships with all of our clients that allow us to truly understand what we’re marketing, creating a better end result. If you’re ready to discuss your project, get in touch with us today!